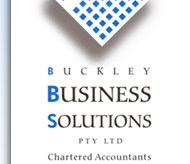 At Buckley Business Solutions of Essendon Victoria we pride ourselves on being friendly and accessible, and as accounting specialists our business is helping you make your business successful. Our goal is to partner with you and be relied upon as a contributing factor to your success. We are highly educated and well-trained accountants, business consultants, tax specialists, valuation specialists, and others working in tandem as part of our client's management team. Using state of the art technology, we fuse strategy with results in an effort to help you grow. Whatever stage your business is at, your Buckley Business Solutions adviser is there to counsel and help you through the transitions, big and small. We ask the right questions because we've been helping our clients with the challenge of change for over 28 years.